This boost will soothe and nourish the nervous system increasing clarity, energy, and mind strength for optimal cognitive health. Herbs: Siberian ginseng*, Ginkgo*, Holy basil*, Bacopa*, Rhodiola*, Schisandra*, Withania*, Gotu kola*. Greens: Barley grass*, Spirulina*. Fruit and Vegetables: Beetroot*, Carrot*, Gooseberries*, Goji berries*, Acai berries*. Siberian ginseng, rhodiola, withania and goji berries act as a tonic for the whole body increasing vitality and assisting the body in times of stress increasing mental clarity and cognition. Ginkgo and holy basil increases cerebral circulation to the brain and are both protective on the nervous system enhancing cognition and reducing brain fog. Bacopa and gotu kola nourishes the nervous system helping to reduce anxiety while improving cognition and mental concentration. Schisandra and spirulina nourish the nervous system and assist the body to produce glutathione which help detoxify and improve mental clarity. 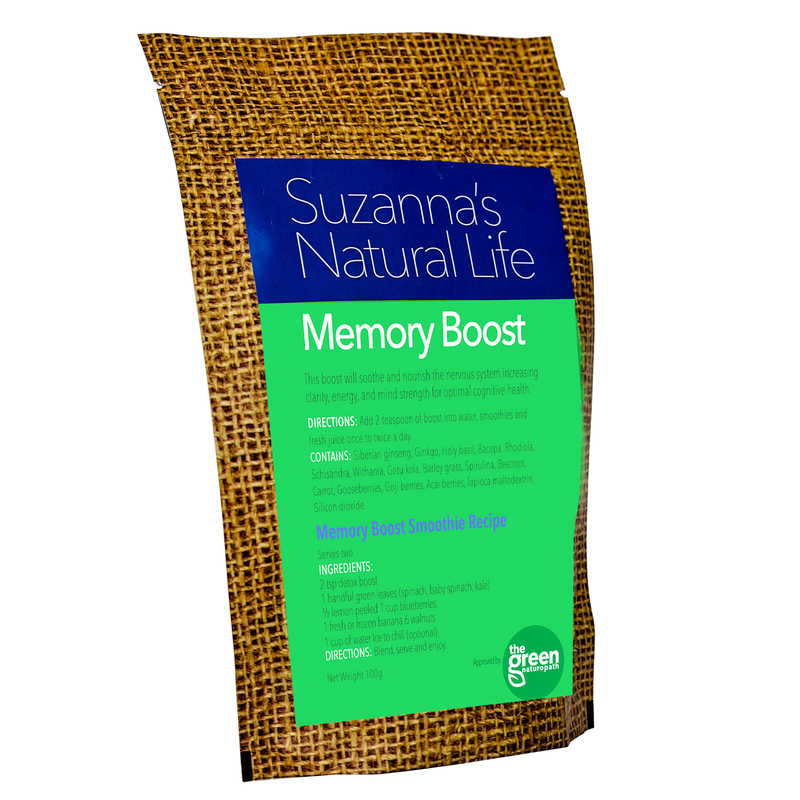 Barley grass and spirulina help alkalise the body assisting in reducing mental fatigue. Spirulina and goji berries are a great source of protein increasing mental energy. Polysaturated fats found in spirulina help to protect the brain and nervous system. Spirulina also helps prevent toxicity by assisting the body in chelating toxic heavy metals from the body. Spirulina, goji berries, gooseberries, gingko and holy basil are packed full of antioxidants assisting in preventing oxidative damage and age related diseases. Gooseberries and goji berries are also a good source of iron helping to assist oxygen transport to the brain improving mental cognition and clarity. Goji berries also help the liver to produce choline which assists with protecting the brain. Beetroot increases blood flow to the brain and assists in preventing aged degeneration in the mind. Carrot contains luteolin to help reduce age related inflammation.